Abner Haynes avoids Buffalo’s Arch Matsos in the 1962 AFL All-Star Game. 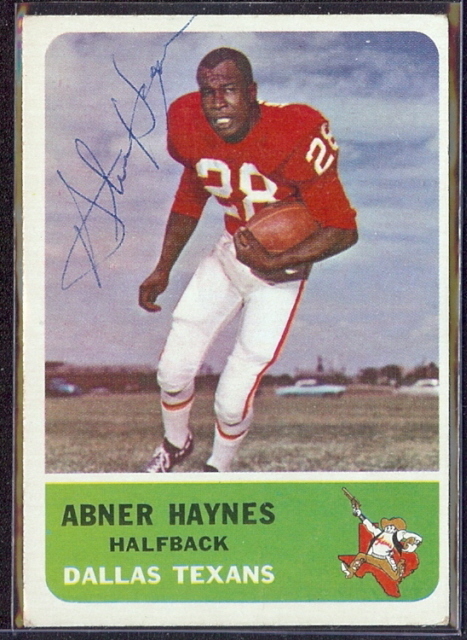 Abner Haynes was drafted by teams in the AFL, NFL and CFL as a senior running back out of North Texas State (now the University of North Texas). He chose to play for the Dallas Texans of the AFL, mainly because of their proximity to his home. 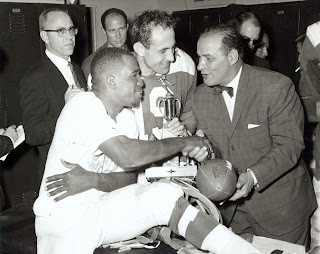 Haynes enjoyed immediate success with the Texans, earning league MVP and Rookie of the Year honors, as well as leading the league in rushing attempts, yards and touchdowns in 1960. Haynes followed up his spectacular rookie season with similarly dominant years in 1961 and 1962. Over the two-year span he rushed for 1,890 yards, averaged 4.7 yards-per-carry, and twice led the league in rushing touchdowns. He was also among the league leaders in kick and punt returns. The Dallas Texans were the AFL Eastern Division Champions in 1962, and beat the Houston Oilers in the AFL championship game. Much is said about Haynes’ flub in overtime of the 1962 AFL championship game. Texans coach, Hank Stram, was aware of strong winds at Houston’s Jeppeson Stadium, and so he instructed Haynes to choose the side of the field facing the stadium clock, which would give the Texans the wind at their backs, if he won the coin toss. Haynes won the coin toss and inadvertently told the referee, “We’ll kick to the clock.” But by stating the words “We’ll kick,” he had forfeited possession of the ball, and allowed Houston to choose which end zone to defend. It proved inconsequential in the end, because the Texans defense held the Oilers scoreless, and won the game on Tommy Brooker’s field goal 2 minutes and 54 seconds into the second overtime. It is unfortunate that fans remember that incident better than they do Haynes’ play that day, as he scored the Texans’ only two touchdowns, on a 28-yard pass reception and a two-yard run. After three years of battling the new Dallas Cowboys and the NFL for legitimacy and fan support, Haynes and the Texans moved to Kansas City and re-invented themselves as the Chiefs. The season, however, was quickly tainted by the death of rookie flanker, Stone Johnson, who suffered a broken neck and later passed away after attempting to throw a block on a kickoff return. Johnson’s death particularly affected Haynes, as the two had been very close. Haynes’ numbers took a dip in 1963; he rushed for only 352 yards on 99 carries over the season. Haynes rebounded in 1964, and teamed with running back Mack Lee Hill to rush for a combined 1,255 yards. Haynes averaged 5-yards-per-carry and scored four touchdowns. 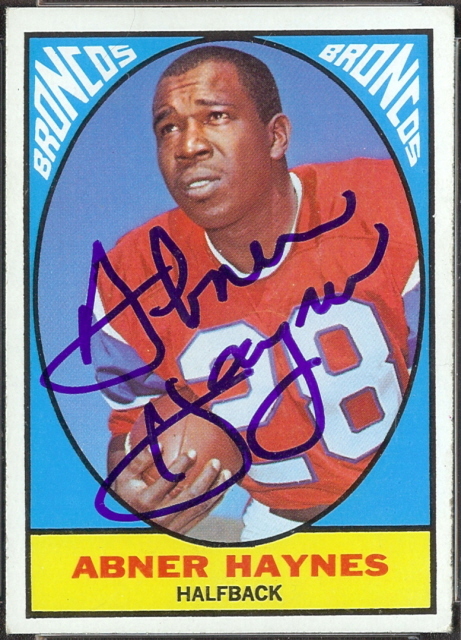 The 1965 season brought Abner Haynes to the Denver Broncos, who had secured the star running back in a trade with the Chiefs for linebacker/punter Jim Fraser. Haynes teamed with Cookie Gilchrist in the Broncos’ backfield, but was used more to catch passes out of the backfield. Though his rushing numbers were the lowest thus far in his career in 1965, Haynes hauled in 26 pass receptions and led the league in kick-off returns with a 26.5-yard average. He also returned punts. The Denver Broncos knew they were heading for a rough season when 17 rookies made their final 40-man roster in 1966. Their problems were compounded when fullback Cookie Gilchrist left the team, and the Broncos were forced to play two halfbacks in the backfield, Haynes and second-year star, Wendell Hayes. The results were disastrous, and the AFL’s second-best ground team of 1965 gained only 1,173 yards in 1966. Haynes had his worst year-to-date, averaging just 2.3 yards-per-carry. He continued to produce in other ways though, and hauled in 46 pass receptions and posted a 25.4 yard on kick-off returns. Haynes played his last year of professional football in 1967, splitting time between the second-year Miami Dolphins and the New York Jets. Though his overall rushing yardage was down to 346 yards, he still averaged 4.8-per-carry and rolled up 569 yards on special teams. All-Star MVP Cotton Davidson looks on as Abner Haynes shakes hands with Sid Gillman after the January 7, 1962, AFL All-Star Game. Haynes scored touchdowns on an 11-yard run and a 66-yard punt return. 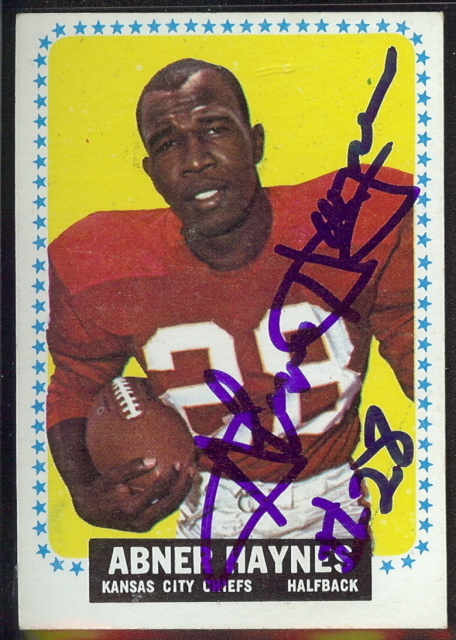 I have a weakness for collecting football cards autographed by the American Football League players. I’m not talking about the new, shiny, gold-foiled throwback cards that can be purchased today for more-than-I-can-imagine per pack. I like the old, original stuff that came with a stick of bubble gum for five or ten cents. I collect all of the AFL cards from that era, from crude 1960 Fleer set through to the 43 players that I plucked out of the 1970 Topps set because they played as rookies in the AFL in 1969. Some of my personal favorites are the 1963 Fleer set with Lance Alworth’s and Len Dawson’s rookie cards, and the famed 1965 Topps tallboys. Just for good measure, in addition to the sets produced by Topps or Fleer each year in the 1960s, I have assembled my own “custom” sets. These topical collections are based on themes, such as “The 20 Men who Played all 10 Seasons in the AFL,” or “The AFL’s Rookies of the Year.” I enjoy collecting these subsets because although they necessitate my acquiring second and sometimes third copies of the same autographed card (or four, as is the case with Ron Mix’s 1967 Topps card), they represent players or coaches for a particular contribution to the game. I am very particular about these special collections (possibly freakish, but hey, we all have our quirks), preferring that the cards are selected from one of the original AFL sets (though 1970 Topps can be a passable substitution). Though I love the set in general, my subset cards cannot come from 1965 Topps because those cards are taller than standard cards and thus require an odd-sized storage medium. Maybe freakish is a little more apt than I like to admit. I recently completed one of these collections, and thought that posting about it would be a great opportunity to introduce a new batch of AFL greats. 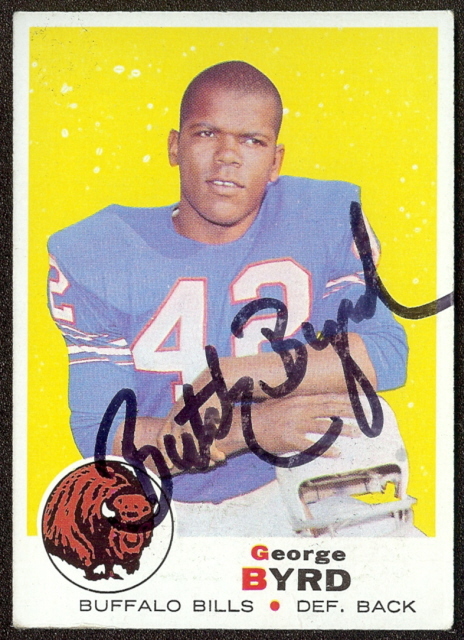 Former Buffalo Bills defensive back, Butch Byrd, returned a couple of freshly-signed cards to me in the mail this week, thus completing my collection of cards signed by The AFL’s All-Time Second Team. So without further adieu, I present the men (and their bubble gum cards) that comprise that great squad. 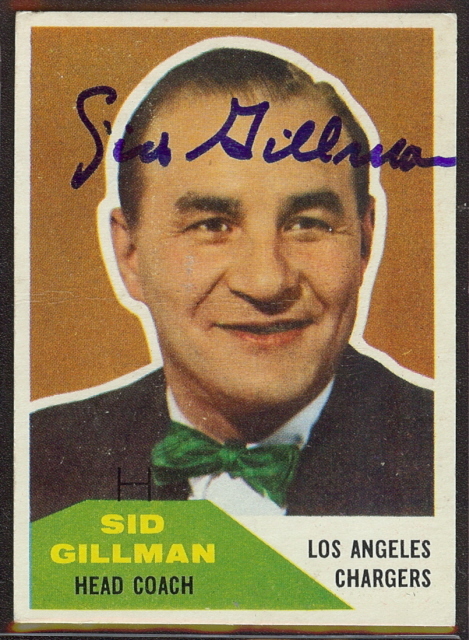 HEAD COACH Sid Gillman – Often referred to as The Father of Modern Offensive Football, Sid Gillman coached the Chargers from 1960-1969 and again in 1971. He is credited with popularizing film study as a coaching tool, implementing the first strength and conditioning program in pro football, and producing a vertical passing game that stretched the defense, forcing them to cover every bit of the field. 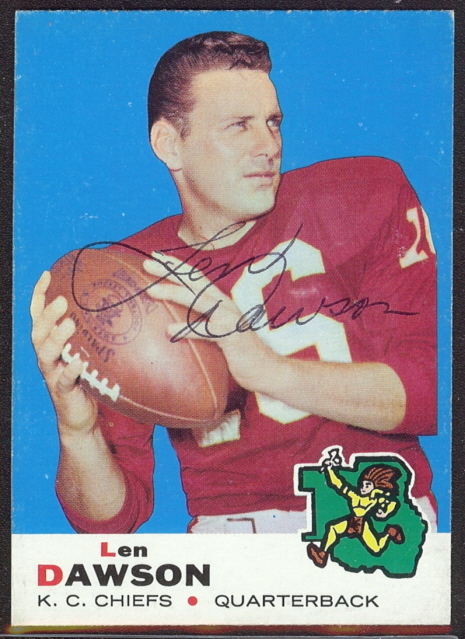 OFFENSE Len Dawson – A former NFL castoff, Len Dawson found a home with the Dallas Texans/Kansas City Chiefs. The Hall of Fame quarterback was a six-time AFL All-Star, 1962 AFL Most Valuable Player (TSN), and MVP in Super Bowl IV. After his playing career ended, Dawson became a member of the sports media, and served as host of HBO’s Inside the NFL from 1977-2001. 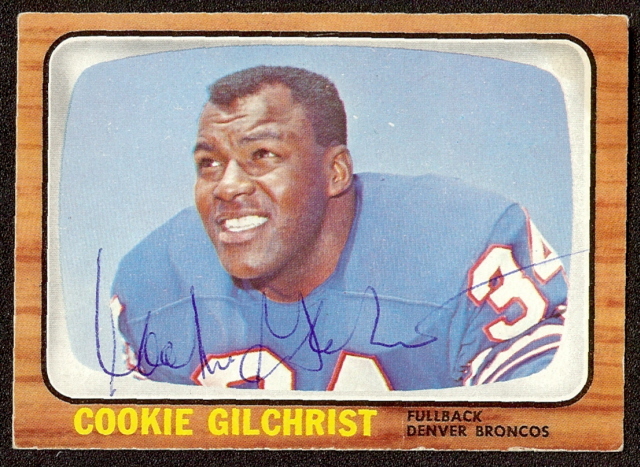 Cookie Gilchrist– Cookie Gilchrist was a hard-charging running back that could also be used at linebacker and place kicker. The AFL’s Most Valuable Player in 1962 (API, UPI) rushed for 1,096 yards and 13 touchdowns in his first season in the league. 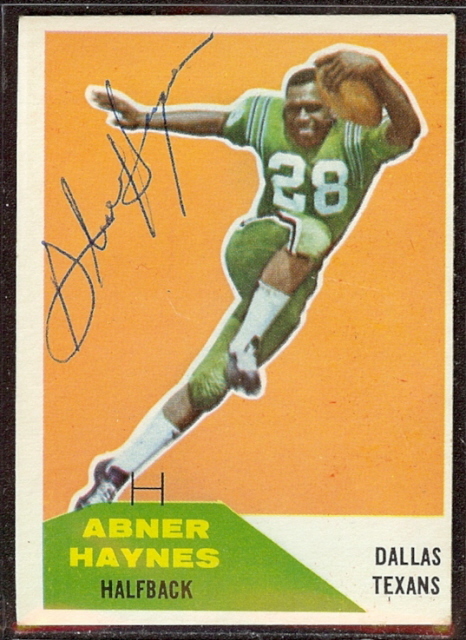 Abner Haynes – Running back Abner Haynes of North Texas, was the first pick of the Dallas Texans in the 1960 AFL draft. 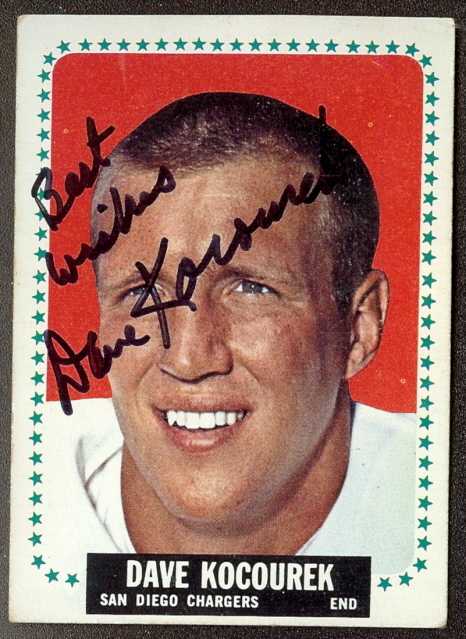 He shined immediately in professional football, earning AFL Rookie of the Year and AFL MVP honors (AP, UPI) in 1960. 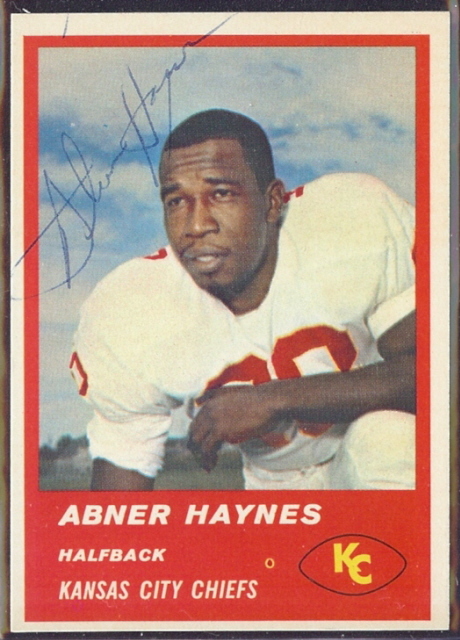 Haynes played eight seasons in the AFL, and was a four-time AFL All-Star and four-time All-Pro. 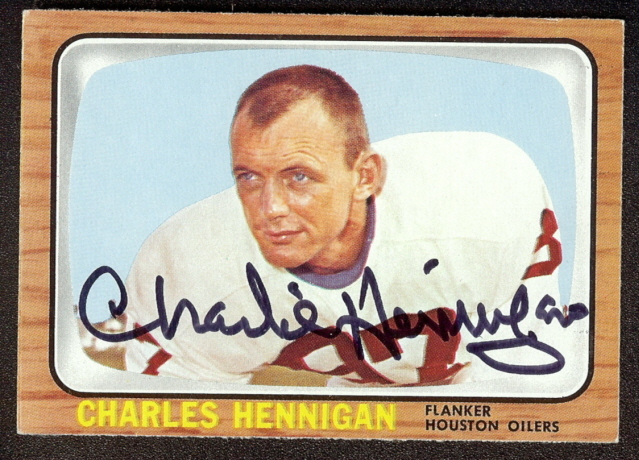 Charlie Hennigan – Charlie Hennigan was a high school biology teacher prior to playing for the Houston Oilers of the AFL. During his first training camp, Hennigan kept his teacher’s pay stub, a $2,700 annual salary, in his helmet to remind himself that he must succeed in professional sports. Succeed he did, becoming a five-time All-Star and two-time AFL champion. 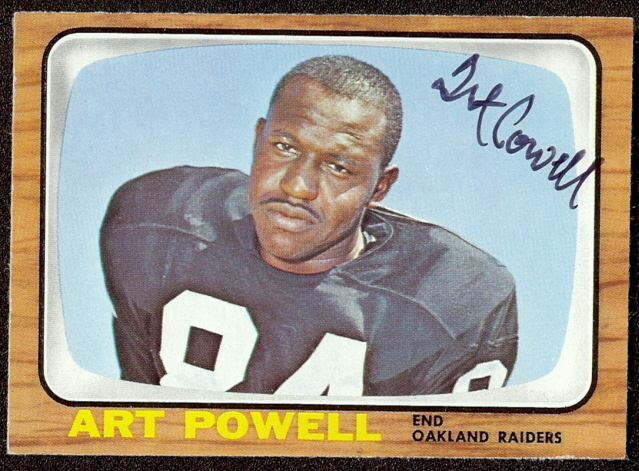 Art Powell – Art Powell was a dominant wide receiver for the New York Titans, Oakland Raiders and Buffalo Bills. After leaving the Philadelphia Eagles for the AFL in 1960, Powell formed half of the Titans’ potent receiving duo with Don Maynard. 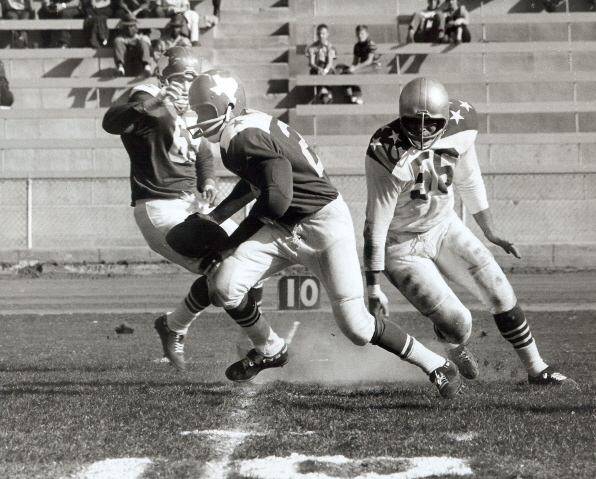 In Oakland Powell was took advantage of Al Davis’s vertical passing game to become a four-time AFL All-Star. Dave Kocourek – Who played in more AFL championship games than any other player? Dave Kocourek played in seven during his nine seasons in the AFL The four-time All-Star played in five championship games with the Chargers (1960, 1961, 1963, 1964 & 1965) and two as a member of the Oakland Raiders (1967 & 1968). 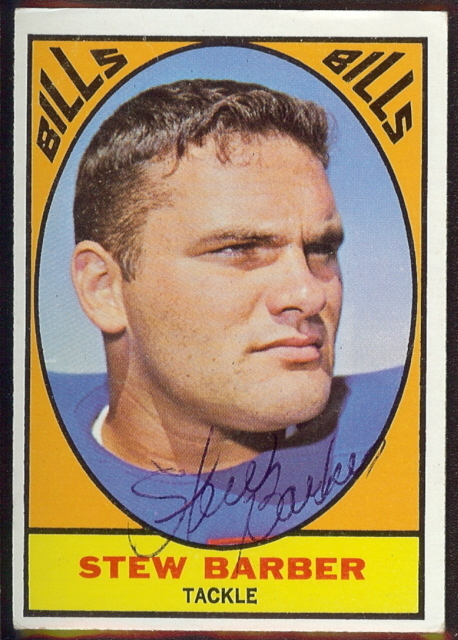 Stew Barber – Buffalo Bills’ tackle, Stew Barber, played in five consecutive All-Star games (1963-1967) and three consecutive championship games (1964-1966), of which the Bills won two (1964 & 1965). Barber is one of only 43 players to play nine seasons in the AFL. 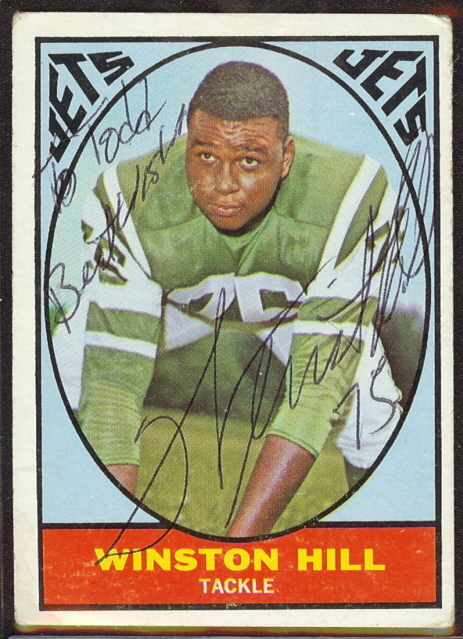 Winston Hill – The massive offensive tackle from Texas Southern University came to the Jets in 1963. The five-time All-Star was a devastating blocker at 6’4”, 270-lbs., and helped lead the Jets offense in Super Bowl III. Hill played 14 seasons for the Jets. 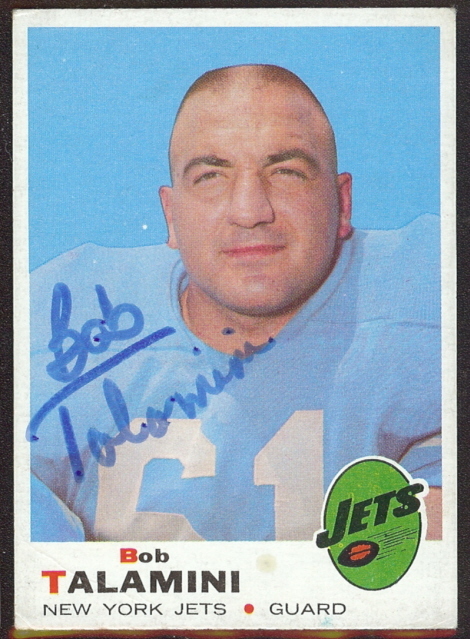 Bob Talamini – Undersized by today’s standards at 6’1″, 250-lb.s, offensive guard Bob Talamini played for the Houston Oilers from 1960-1967 and with the New York Jets in 1967 & 1968. He was an AFL All-Star from 1962-1967, won AFL championships in 1960 & 1961 with the Oilers, and was a member of the Jets during their victory in Super Bowl III. 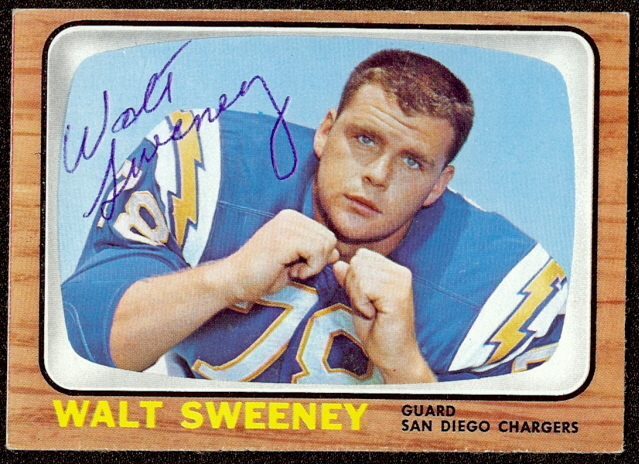 Walt Sweeney – A first-round draft pick of the Chargers in 1963, Walt Sweeney immediately endeared himself to Chargers fans with his reckless play on special teams. 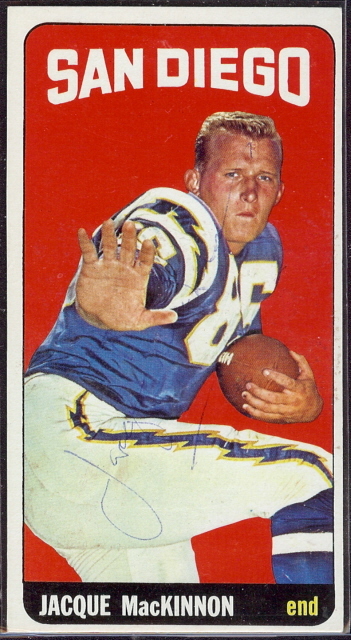 Sweeney was an end in college, but was moved to guard by the Chargers, and became one of the AFL’s best at his position. Sweeney was an AFL All-Star from 1965-1969. In 1968, Pro Football Weekly selected him to its combined all-pro team. 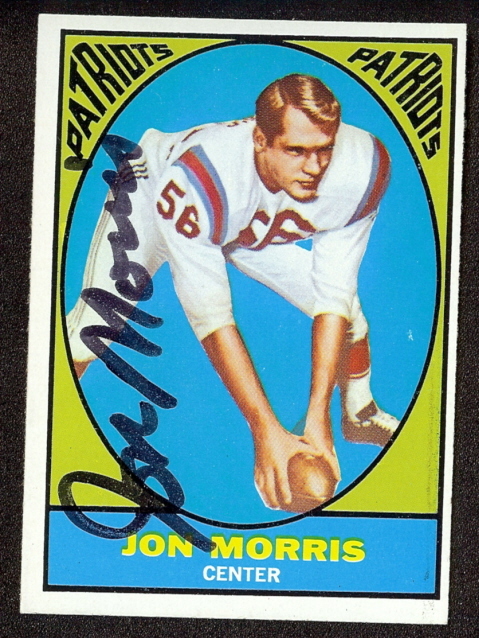 Jon Morris – Center Jon Morris was the Patriots’ team Rookie of the Year in 1964, their “Unsung Hero” in 1965, and an AFL All-Star from 1964 through 1969. He played in 128 games for the Patriots, the eighth-best individual record in club history. 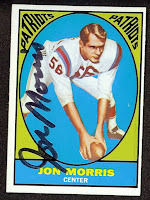 After leaving the Patriots, Morris played three years (1975–1977) with the Detroit Lions, and his final professional season with the Chicago Bears in 1978. 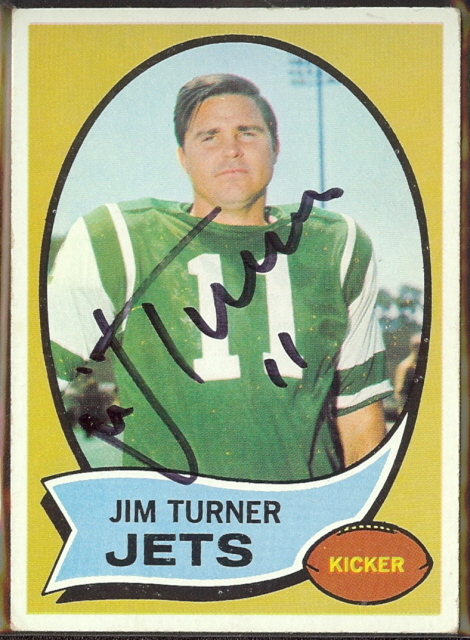 Jim Turner – Jim Turner was signed as a free agent in 1964 by the New York Jets head coach Weeb Ewbank. “Tank” Turner kicked for 145 points in the 1968 regular season, with a pro football record 34 field goals. He kicked for nine points in the AFL Championship game win over the Raiders, and 10 points in Super Bowl III. 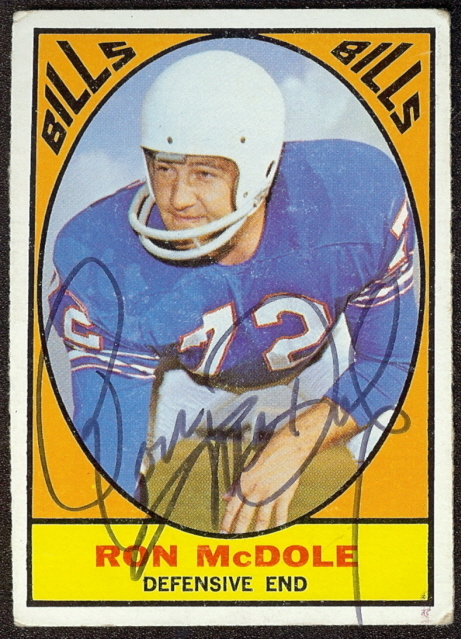 =&2=& Ron McDole – The Bills’ defensive captain, McDole was nicknamed “The Dancing Bear” because of his large size and nimble feet. He anchored a tough Bills’ defensive line that held opponents without a rushing touchdown over 17 games in the 1964 & 1965, both championship seasons for Buffalo. Barber was a two-time All-Star. 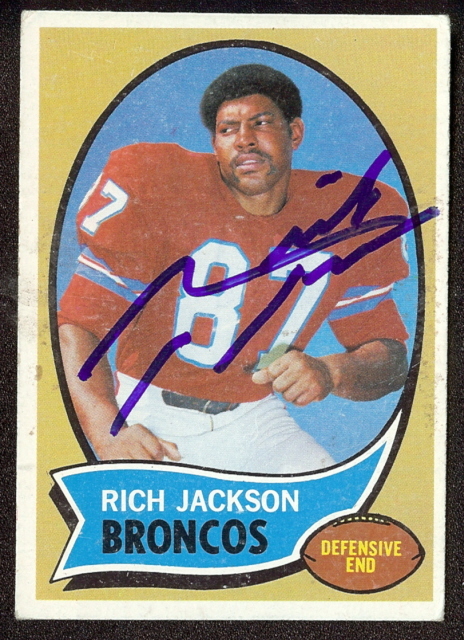 Rich Jackson – Rich “Tombstone” Jackson was signed as a free agent by the Oakland Raiders in 1966, but made his name as a member of the Denver Broncos, for whom he played from 1967-1971. The two-time All-Star defensive end was known for moves such as the “head slap” and the “halo spinner” which he used to in battling opposing offensive linemen. Jackson totaled 43 quarterback sacks in a career cut short by a severe knee injury. 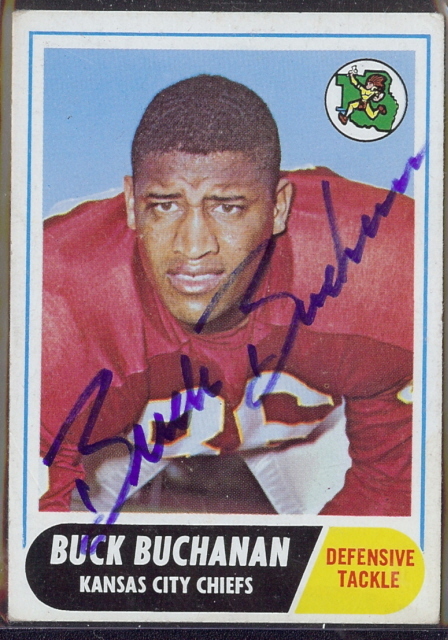 Buck Buchanan – One of the first true “big men” in pro football, the 6’7″ 287-lb Buchanan was the first player selected overall in the 1963 AFL Draft by the Kansas City Chiefs. 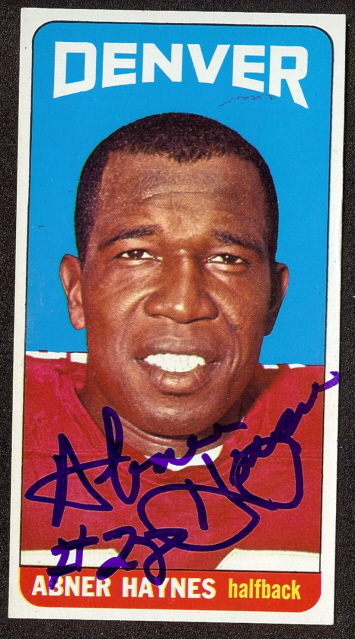 Big Buck played in six AFL All-Star games, and teamed with Curley Culp, Aaron Brown and Jerry Mays to form the dominant front four that helped lead the Chiefs to victory over the Minnesota Vikings in Super Bowl IV. 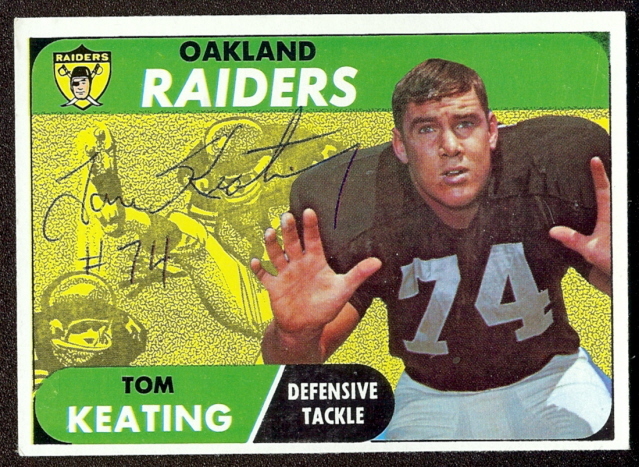 Tom Keating – Tom Keating was drafted in the fifth round of the 1964 AFL draft by the Buffalo Bills. He played two seasons in Buffalo before joining the Oakland Raiders. The two-time All-Star was a two-time AFL-champion, and played in Super Bowl II against the Green Bay Packers. 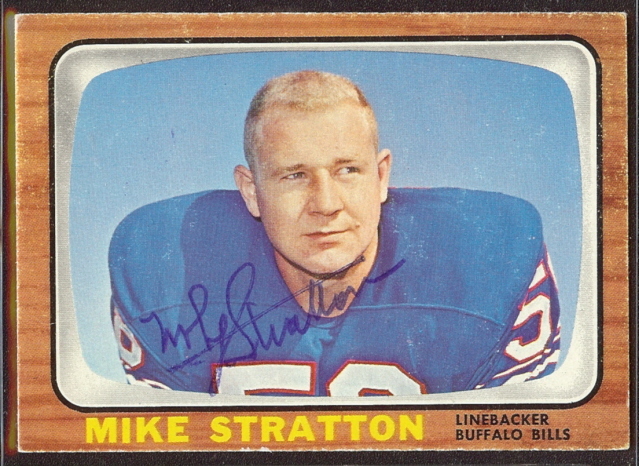 Mike Stratton – This six-time All-Star was a defensive leader for the Bills during their championship seasons in 1964 & 1965. He anchored a tough linebacking crew, and is most notably known for delivering the “hit heard ‘round the world,” a crushing blow to the Chargers’ Keith Lincoln, which deflated the San Diegans and helped seal the Bills’ championship game victory in 1964. 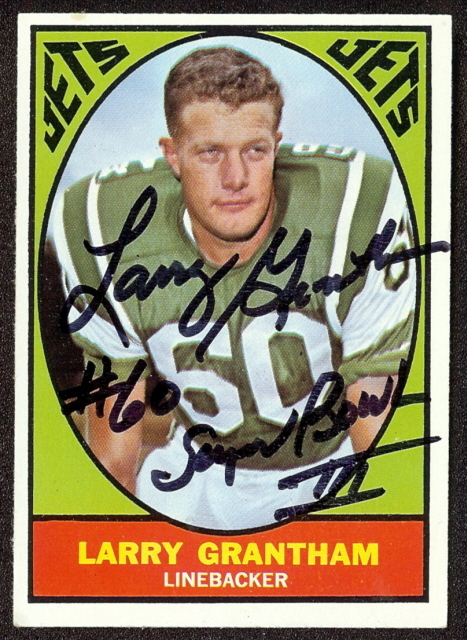 Larry Grantham – Larry Grantham, a five-time AFL All-Star, came to the New York Titans from the University of Mississippi in the 1960 collegiate draft. His solid play from the right outside linebacker position helped the Jets reach the playoffs in 1968 and 1969, and win the famed Super Bowl III over the Baltimore Colts. Grantham is one of just 20 players who were in the American Football League for its entire ten-year existence, and one of but seven AFL players who played their entire careers in one city. 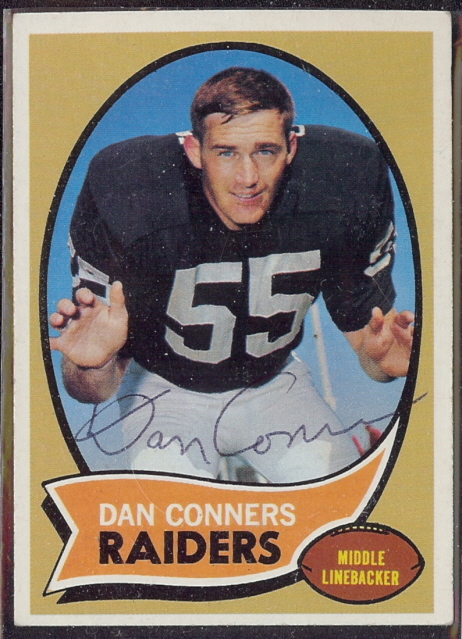 Dan Conners – A fifth-round pick out of Miami, Dan Conners was a fixture at linebacker for the Raiders from 1964-1974. The three-time All-Star led the Raider defenses that won an AFL championship in 1967 and faced the Green Bay Packers in Super Bowl II. Butch Byrd – Butch Byrd was an excellent defensive back who doubled as a fine punt returner. Though he retired more than 35 years ago, the five-time All-Star still holds the Bills’ career records for interceptions (40), interception return yards (666) and interceptions returned for touchdowns (5). 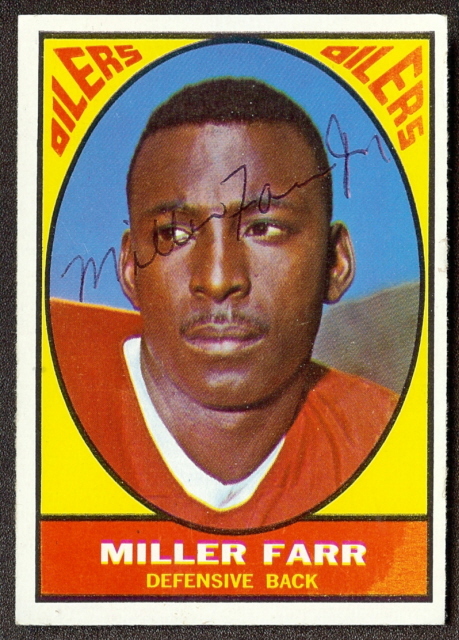 Miller Farr – Miller Farr, a three-time All-Star, was the first round draft choice of the Denver Broncos in 1964. 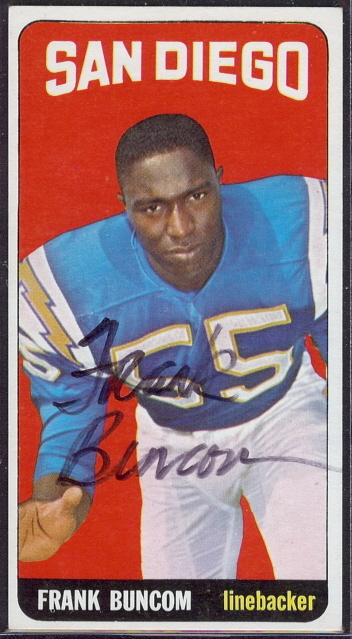 He played for the San Diego Chargers in 1965 and 1966, and the Houston Oilers from 1967-1969. 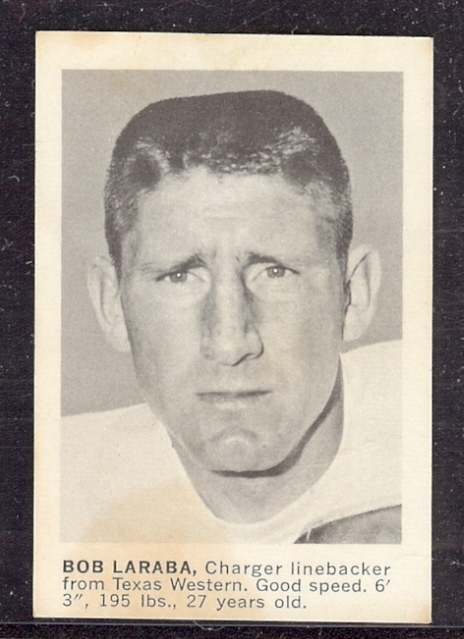 He was the 1967 AFL co-leader in interceptions with 10. Farr set an AFL record for the most interceptions returned for touchdowns in a single game (2) and tied the AFL record for a season (3). 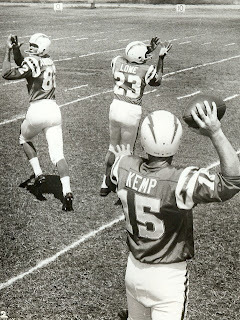 Kenny Graham – Relatively unheralded coming out of college, Kenny Graham became a hard-hitting safety and punt-returner for the Chargers from 1964-1969. At 6’0” and 195-lbs, Graham made his presence known with savage hits in the defensive backfield. He was a ballhawk at safety, picking off 25 passes during his time in San Diego, five of which he returned for touchdowns. 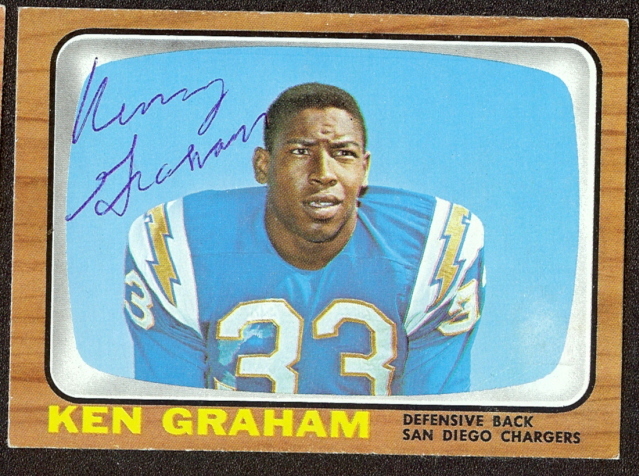 Kenny Graham was a four-time AFL All-Star. Goose Gonsoulin – An original Denver Bronco, Gonsoulin ended his career as the all-time American Football League leader in interceptions with 40. He made the AFL’s first-ever interception in the September 9, 1960, game against the Boston Patriots. He had seven interceptions in his first three games in the AFL, and his 11 pickoffs in 1960 are still a Denver Broncos team record. 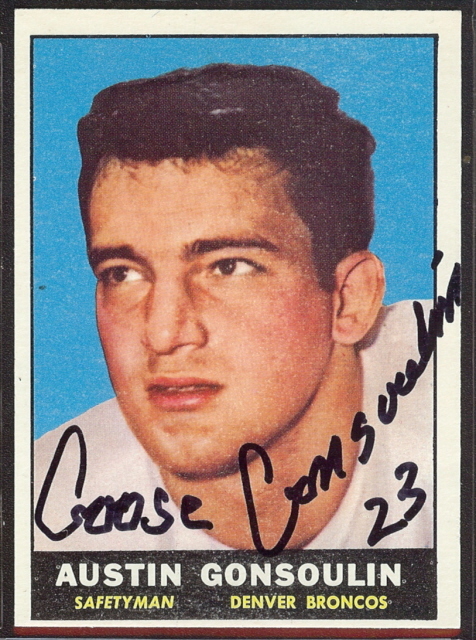 Gonsoulin was an AFL All-League player in 1960, 1962, and 1963, and an AFL All-Star in 1961, 1964 and 1966. 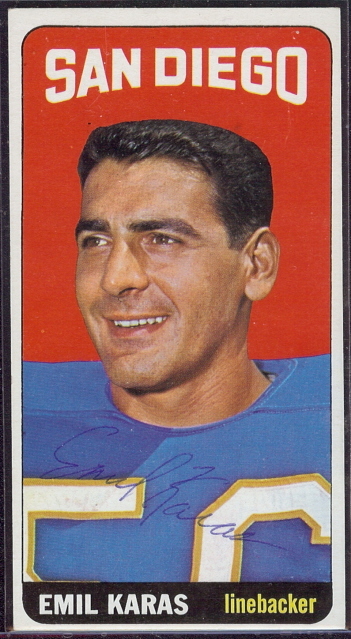 Bob Scarpitto – A halfback, flanker, and punter, Bob Scarpitto was drafted by the San Diego Chargers in 1961. He played for the Denver Broncos from 1963-1967, and for the Boston Patriots in 1968. 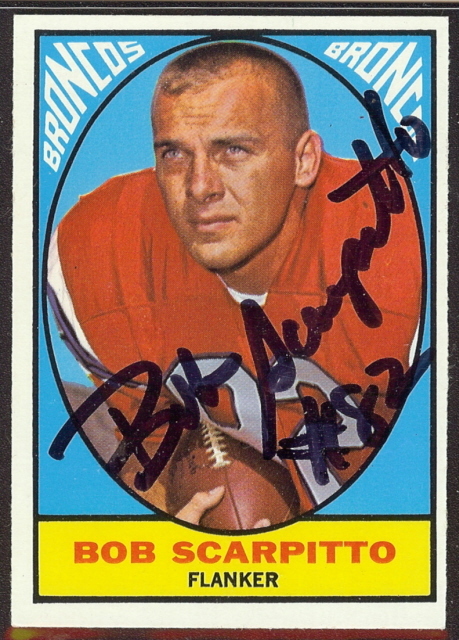 A 1966 AFL All-Star, Scarpitto had a 43.8-yard punting average over four years, and had 27 touchdown receptions as a receiver.